By Todd Abelson NMLS #180858 on February 11, 2019 . The stock and bond markets both realized modest gains with the major stock indexes recording their seventh consecutive weekly gain. The main driver of investor sentiment this week seemed to be news centering on the trade dispute between the U.S. and China. Expectations for a deal with China before a March 1 trade deadline were diminished after National Economic Council Director Larry Kudlow stated trade negotiators had “miles to go before we sleep.” Kudlow was not only paraphrasing poet Robert Frost, but also Commerce Secretary Wilbur Ross who had commented earlier in late January about being “miles and miles” from an agreement. Furthermore, President Trump confirmed it is unlikely he will meet with China’s President Xi Jinping before the trade deadline. Unless the March 1 90-day tariff truce deadline is extended, the U.S. is scheduled to raise the tariff rate on Chinese goods to 25% from the current 10% rate. However, CNBC also reported the U.S. was likely to keep the current 10% tariff rate in effect in the absence of a meeting. The week’s domestic economic data were generally favorable. The most significant report was one measuring U.S. service sector activity indicating solid expansion, but slightly below the consensus forecast and not quite at the record pace seen in prior months. Also, weekly jobless claims declined from the prior week as was widely expected. Manufacturing activity slowed somewhat with November factory orders retreating unexpectedly. In housing, CoreLogic released their Home Price Index (HPI) and HPI Forecast for December 2018 this past Tuesday showing home prices increased year-over-year by 4.7%, the slowest price growth rate since August 2012. Month-over-month, home prices increased by 0.1%. 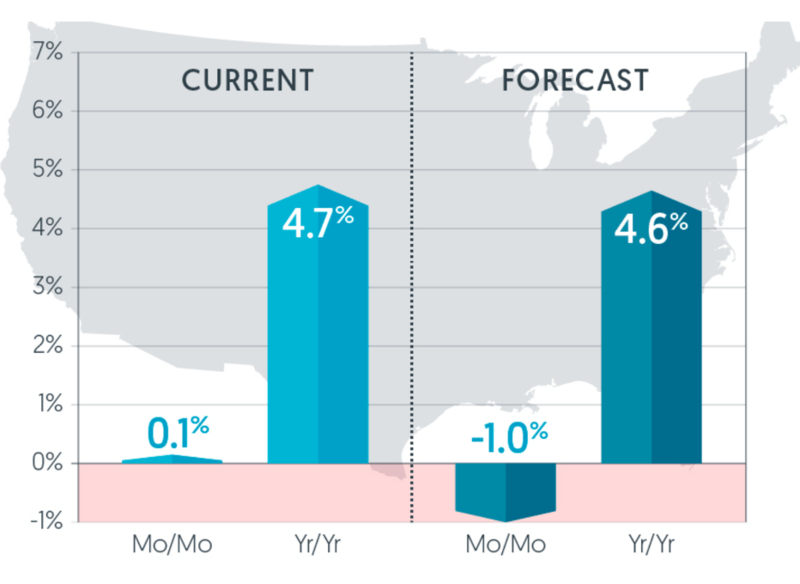 After gazing into a crystal ball, the CoreLogic HPI Forecast predicts home prices will increase by 4.6% on a year-over-year basis from December 2018 to December 2019. When comparing the annual average HPI and HPI forecast for 2018 and 2019, CoreLogic is forecasting average price growth to lose pace from 5.8% to 3.4%. On a month-over-month basis, home prices are forecast to decline by 1% from December 2018 to January 2019. In the realm of mortgage data from the Mortgage Bankers Association (MBA), the weekly mortgage applications survey showed the number of mortgage applications decreased from the prior week. The MBA reported their overall seasonally adjusted Market Composite Index (application volume) decreased 2.5% for the week ended February 1, 2019. The seasonally adjusted Purchase Index decreased 5% from a week prior while the Refinance Index increased 0.3%. Overall, the refinance portion of mortgage activity decreased to 41.6% from 42.0% of total applications from the prior week. The adjustable-rate mortgage share of activity decreased to 7.8% of total applications from 7.9% the previous week. According to the MBA, the average contract interest rate for 30-year fixed-rate mortgages with a conforming loan balance decreased to 4.69% from 4.76% with points decreasing to 0.45 from 0.47 for 80 percent loan-to-value ratio (LTV) loans. For the week, the FNMA 4.0% coupon bond gained 25.0 basis points to close at $102.297 while the 10-year Treasury yield decreased 5.0 basis points to end at 2.634%. The Dow Jones Industrial Average gained 42.44 points to close at 25,106.33. The NASDAQ Composite Index added 34.33 points to close at 7,298.20. The S&P 500 Index advanced 42.44 points to close at 2,707.88. Year to date (2019) on a total return basis, the Dow Jones Industrial Average has added 7.63%, the NASDAQ Composite Index has gained 9.99%, and the S&P 500 Index has advanced 8.02%. This past week, the national average 30-year mortgage rate fell to 4.44% from 4.53%; the 15-year mortgage rate decreased to 4.05% from 4.12%; the 5/1 ARM mortgage rate declined to 4.38% from 4.40% while the FHA 30-year rate decreased to 4.13% from 4.18%. Jumbo 30-year rates decreased to 4.28% from 4.35%. 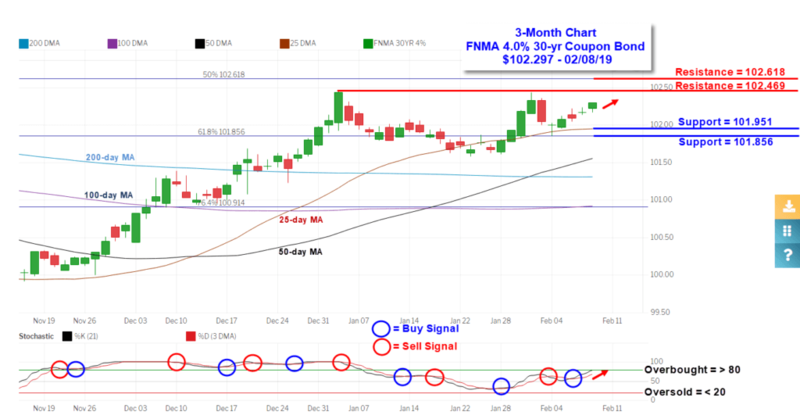 The FNMA 30-year 4.0% coupon bond ($102.297, +25.0) traded within a narrower 43.8 basis point range between a weekly intraday high of $102.297 on Friday and a weekly intraday low of 101.859 on Monday before closing the week at $102.297 on Friday. Mortgage bond prices bounced higher after touching support on Monday near the 61.8% Fibonacci retracement level ($101.856) and continued toward resistance located at $102.469. As the bond is not yet “overbought” and the technical chart appears more bullish than bearish in the short-term, we will likely see the bond’s price continue toward the resistance levels marked on the chart below. 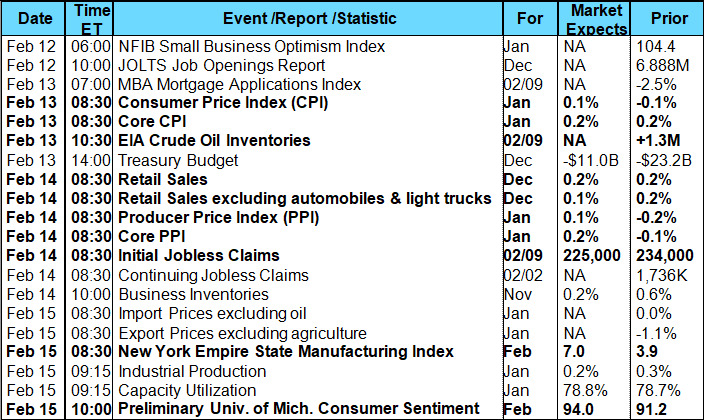 There are a considerable number of potential market-moving economic reports scheduled for this week headlined by inflation and retail sales data and the bond market will likely direction from these reports. From the technical chart, bond prices this coming week should trade between support found at the 61.8% Fibonacci retracement level ($101.856) and resistance at $102.469. Trading between current support and resistance levels with a bias toward slightly higher prices should result in stable mortgage rates or rates moving slightly lower.